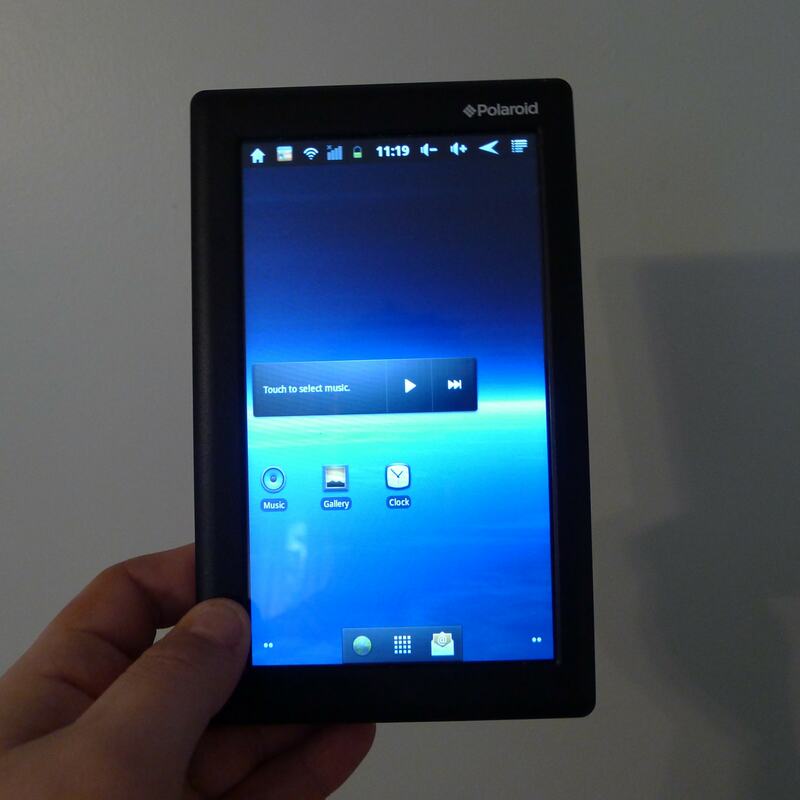 Polaroid's second budget 7" tablet showed up on store shelves yesterday morning and I was there to get it. The PMID701C is a bland looking black slab with a 7" capacitive touchscreen and it's running Android 2.3 on a single core 1GHz CPU. I've spent the morning playing with it, and it's not bad. I'm a little concerned about the battery life, but other than that it's an okay budget tablet. It's an almost featureless slab with all the ports on one short end, the buttons on the long end, and the speaker on the back. It has a solid feel to it. The touchscreen is quite responsive and I've really come to like the general vibe of the device. This tablet has a few quirks that have me scratching my head. I've looked through the setting menu and it options for Ethernet and 3G, but it doesn't have the hardware for either. It also has a port where you should be able to plug in a TV out cable, but no cable was included. It also has text to speech, but I don't see an app that can use it. Weird. It comes with Kobo and a lot of other apps (see photo for more details) but no app store. I've installed the Amazon Appstore as well as a number of apps, including games, Kindle, Aldiko, an RSS reader. Youtube worked, and so did the email client. I've downloaded a couple ebooks. I've even set up my Twitter account on the included app. It's rather bland but I like it enough that I plan to set aside my Galaxy Tab for the next week and use this in its place. The Galaxy Tab has a camera and Google Play, but I don't expect to need either feature this week. P.S. Polaroid's first 7" budget tablet came out around black Friday 2011, but it didn't get much attention. It was the PTAB7200, and I noticed it for the first time at CES 2012. I know the Note is six times the price of this tablet, but I think once you try it, it will leave most of your gadgets gathering dust. The screen is a lot better, the processor is a lot better, the cameras are a lot better and it has a 3G/4G radio. It all adds up. Samsung could probably sell the Note for 50-100 less, yes, but of course they choose to take some profit. A better comparison would be one with other phones that also have high-end components. The Note’s price is basically the same as that of the Nexus and the iPhone 4S, but trust me, after you’ve tried the big screen there’s no going back. I lost Kobo when I upgraded my firmware to 2.3 and now I can’t get Kobo until I get Google play, which isn’t available either for this tablet. Help! The review was about the Polaroid PMID701C, not the Note. You want to talk about the Note then go to the Note review. I came here to see the review on the PMID701C. The Polaroid PMID701C ANDROID TABLET, JUST BOUGHT ONE A BIG LOTS FOR $99.99. I TRIED IT IT WORKS GREAT, BUT HAS ON FAULT, NO GOOGLE ANDROID MARKET ( GOOGLE PLAY) IS NOT INSTALLED AND I CAN’T SEEM TO BE ABLE TO DOWNLOAD ANY APPS FROM GOOGLE. GOOGLE WON’T AKNOWLEDGE THE POLAROID TABLET. I WAS ABLE TO INSTALL AMAZON APP AND SOME OTHER APP DOWNLOAD PLACE AND WAS ABLE TO DOWNLOAD THINGS. POLAROID DID INCLUDE AN APP INSTALLER, BUT HAVE NOT BEEN ABLE TO USE IT. HOW WOULD I INSTALL THE ANDROID MARKET APP OR GET GOOGLE TO ACKNOWLEGE THIS TABLET. I HAVE PURCHASED TABLETS DIRECT FROM CHINA AND NEVER HAD PROBLEM AND THEY HAD ANDROID MARKET AND PLAY PRE INSTALLED. PLEASE HELP. Those Chinese tablets had Android Market installed illegally, before they were shipped. Polaroid doesn’t have that option. You have to install it. Play.google.com. I bought one of the Polaroids at Big Lots, too because I needed a sturdy, basic set up that could double as a reader. Only disappointment is lack of camera. Android Market pretty much no longer exists. Google Play is the same set up and the same program. Do a little research before you start complaining. People slip up and write one when they mean the other. There is no need to pick nits. How do you download apps then? If it doesn’t have google play. This is on the PMCID701c right? Still Need Help With Google Play Store On Polaroid Tablet? I just purchased a polaroid A7 tablet but don’t understand it. I am trying to hook to the internet using Wi-Fi. It will not authenticate. Everytime I try I get the same message – authentication problem. Can you help please. Actually, the Amazon app store is soooo much easier to use, why waste your time with Google? I agree, the Amazon App store mostly have apps for the Kindle, which is very similar in size & specs to this little budget tablet. Google app store will of course have more stuff BUT it is a bunch of stuff you can’t use because they are optimized for phones.. It took me all of 10 minutes to get the full android market on this device since it is partially rooted any way, you mileage may vary, and use at your own risk but it definitively worked for me… http://www.freaktab.com/showthread.php?491-****OFFICIAL-Polaroid-PMID701c-THREAD!-root-market-and-more! I never was able to get Adobe Flash to work on my Polaroid tablet. I was able to find the 11.x version at the Adobe website and install it. However, whenever I go to a website using Flash, there would just be an icon of what looks to be a Lego piece with question marks on the side of it — I guess implying that the Flash component is not available. Maybe someone else has this same issue and fixed it? See this posting on how to install or download apps from the Android market to this table. See the second post from androsh, then let us know if it works for you. I am planning on getting that polaroid today from Big Lots as well…lets see. For a $100 bill this is actually a really good capacitive touch screen 1 GHZ processor tablet. Check the specs and compare them against low end tablets. I use if for Netflix, simple games, Pandora & checking my email. The Amazon app store I use is actually better since most of the apps adopted for the Kindle screen size which is similar. Trust me, most in this price range are Resistive touch, and don’t have 1 ghz processors. Of course you can pay more and get more, but for me this is sweet sport for the price. I got one and like it but will usually not play Netflix more then a minute and then messes up. The sound continues fine but the picture will freeze. I’ve tried resetting, clearing the cache and made sure no other programs were running and memory was free. Nothing helped. Does Netflix play right all the way through the movie? Are the voices in sync with the video? Just got done watching a whole movie through netflix with no problems. Didn’t stop to buffer once. Sound sync seemed ok. It’s the middle of the day here, so my 5mb net connection is at it’s best. Just so you know, I was in the middle of a charge cycle when I read your note, so I watched the movie while charging. Also, I watched the movie within 5 ft of my wireless, g, router. In general, this is my first tablet, and I must say, I am pretty pleased with it so far. Maybe I just don’t know any better. I just purchased a Palaroid tablet touch screen from Big Lot today. I need some info. about this device. I was told that I can buy books any where. I have an e-reader and I get my books from Amazon. With this Polaroid Tablet I’m not interested in playing games, or watching movies; just reading , checking e-mail and I guess that’s it. I bought it because of the price and to take on vacation. i just bought this tablet 2 days ago, and fell in love. with the help of killerkink at androidtablets.net, clockworkmod recovery is a go! if you want it head over to http://www.androidtablets.net/forum/allwinner-a10-based/35217-clockworkmod-recovery-touch-support-allwinner-a10-based-tablet.html and check it out for yourself. happy recovering and porting! for those of you who have bought the tablest, is there a regular size usb port and is the memory expandable . Also do you think I would have trouble downloading coupon printer software and printing out coupons? Sorry for all the questions, not a big tech person but big lots actually has any left it’s sounding like a pretty good tablet. It has a mini USB socket like on most cameras. You can add a micro SD card up to 32gb, but I haven’t found a way to install apps to it. It seems to be just for media storage. You can’t upgrade the internal memory. I bought this today and it perhaps the best android tablet for its price range. However, the advertisement is somewhat misleading. I believe it is a marketing problem or upper management engineering (managers who don’t have engineering experience just politics and money) problem versus real engineering. It is apparent that the device itself is good. Ok, this will be my last update since I’m donating it to the house for the kids to use. I bought this so I could go Vegas and NOT take my laptop. I installed everything thing I could think of before hand and off we went for our 20 year wedding anniversary. Overall I will give the tablet 9/10 out of 10. Mapquest was a life saver, Netflix got us through the airport downtimes, I used it to find shuttles, attractions, eateries, etc. I used a CaseLogic case from Wal-Mart for $20 and it truly did about %90 of what I would have done with my laptop, especially allowing me to keep track of spending. Even without GPS you can move around fairly well and battery life was NEVER an issue. I charged at night and was fine for the entire day with off /on usage. You will need a wall plug usb adapter, I used the one from my iPhone. We could watch a movie and only use %25 battery. I will say this, Android seems to be sensitive to application installs. If I got a “force close” or “random reboot” I would immediately uninstall the last application I installed and the problem would go away. It fits nicely in a fanny pack and passed the “Vegas” Test with an A. I wouldn’t hesitate to use it again on another cross country trip. I bought my uncle a 10″ Polaroid tablet for Christmas. It is running Ice Cream Sandwich. He can’t watch netflix movies. He can log into his account and select a movie but it won’t run the movie. Any idea why? Any help you can provide will be appreciated. Bought one this week for my Bday. Haven’t taken out of the box yet. I am exited to find out what it will do. First tablet for me. couldn’t justify paying more than this for a “toy” for songs, pics, and multi media entertainment that duplicates what my pc and laptop already does. $99 I can justify. I bought this tablet this weekend. Great price and i have only had one question. Ive downloaded the bible twice and cant seem to be able to use the bible app like i need too. They were downloaded from KOBO and one bible i cant get the new testiment and i cant figure out how when i getto the book of te bible i want to read, i cant just go to that book. Can anyone help me please, this is my first tablet!!!!!!!!!! I’ve had my 701c since March 30th. Well, kinda. The first one I had did have problems and kept rebooting on me but I exchanged within a week. The new one so far has been great. The unit is now rooted and I use Google Play for most of my apps. Play Books seems much easier to find and read books on than Kobo. I like the Amazon store as well though. I have movies on my sd card and games for my kid loaded & so far so good. I haven’t replaced my computer with this but it is a fair extension. If I could add anything I would add gps & a camera for video chat. We bought one for my son at Big Lots, and it seems to be having difficulty connecting to our wireless network. My husband’s LG phone did the same thing, and he figured it out for the most part, but I was wondering if there’s a quick fix to this. It connects, then goes to authenticating, then disconnects. Any suggestions? I just bought one and I love it. This is after trying the Sylvania and the Cruz tablets that were also available at Big Lots. They told me they had the PMD701C andPMD701I and I bought the PMD701C. I like it a lot better than the Sylvania and the Cruz and I’m kicking myself for not getting it from the start. No, it doesn’t have Google Play but Netflix works okay. Some of the videos don’t sync with the audio but I may not use it that often for Netflix. I would love to root it and add Google Play but I’m scared to death that I might brick it and it’d be useless. The screen is very clear and super responsive. The Sylvania has the resistive touch and I did not like that at all. If you want something cheap and basic, this is a good buy. If you’re brave enough to force load Play, you’ll have an awesome little first tablet. Plus, it’s much lighter than the other too and my wrists are grateful. How do I download Adobe flash on my Polaroid tablet? Bought the polaroid tablet for my granddaughter in April. She loved it, but now it will not work at all. She threw the box away so I don’t know what to do with it. Any suggestions? I bought 3 of these for my kids for Christmas. Does anyone know if I can use one Amazon account and share the apps or do I need to create seperate accounts for each? Yes, the tablets can share an account. Just got a refurb 701c a week ago, and I’m loving it. Along with installing android market, installed a root uninstaller to uninstall the phone.apk . The device was constantly looking for a phone device…..and robbing me of some battery life. Also uninstalled the phone contacts, which is also useless. By the way, I’m not missing the GPS or the camera. It’s a small sacrifice, but my phone will fill in on those areas. For a sub $100 tablet, this one is hard to beat. With a little hacking, my tablet is able to go over 7 hours on a single charge….and thats heavy surfing, and Angry Birds. I bought the Polaroid 7″ for my kids for Christmas, and have been having issues with both of them. Both are connected to our home wireless, but have to be reconnected each time you turn it on, it doesn’t seem to hold the connection. The other problem we are having is I spent hours setting up my sons tablet with Amazon, Angry Birds etc. and he played it all day until the battery died, charged it and went to play it the next day it had completely reset… so I had to redo all of the things I did the day before. Are we alone in these problems?? or is this something they there is a fix for??? does anyone know anything about the PMID705? My son got one for Christmas and am trying to find a case with a keyboard. Having a hard time due to connectors, any suggestions? Haven’t used the 705, so I can’t be certain, but I think all of the current Polaroids have the same connectors. If so, your best bet is to get an OTG connector (It’s a short cable with a mini USB male connector on one end and a female USB port on the other). Then you can use any keyboard with a USB connection.